A jar feeder, by the way, is a Mason jar or any jar with little holes poked in the metal lid. 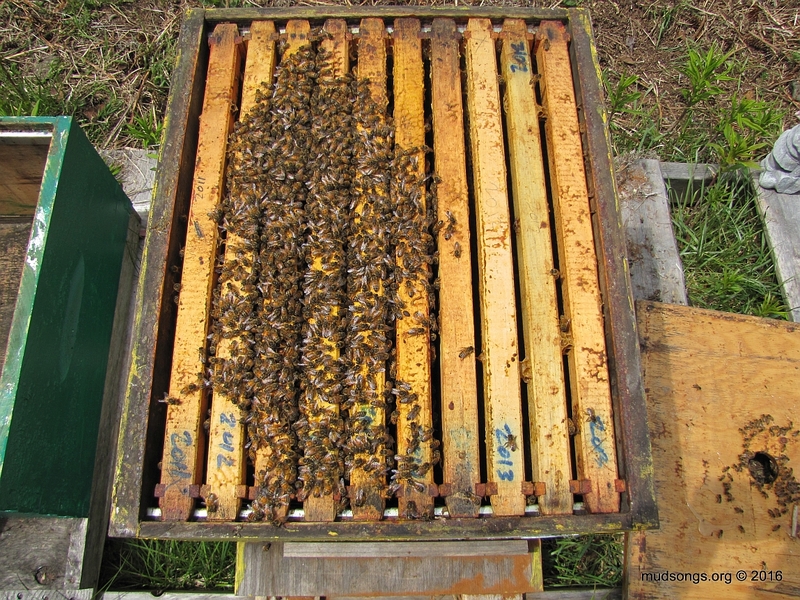 The jar is filled with honey or sugar syrup (in this case, for spring feeding, a thin 1 part sugar, 1 part water mixture), tipped upside and placed inside the hive over the inner cover (but sheltered inside an empty super). Got it? Tip #1: Don’t place the feeder directly over the inner cover hole when night time temperatures can still hover around freezing. 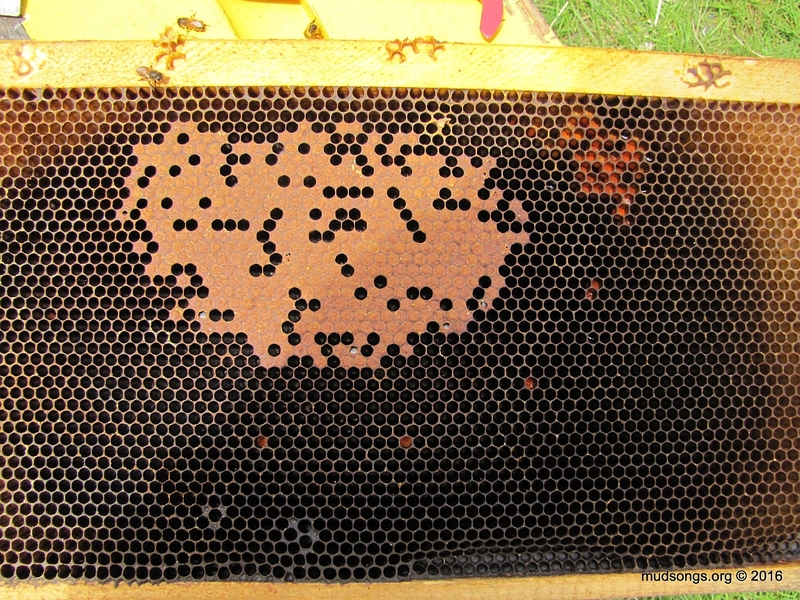 The syrup can expand and contract with the temperature fluctuations and leak all over the bees (speaking from experience here), and not just any bees but the baby bees that are right in the middle of the hive — the brood nest — directly underneath the inner cover hole. It may be easier for the bees to access the syrup when it’s directly over the inner cover hole, but I’m not sure it’s worth the risk. I don’t use jar feeders until nighttime temperatures are above freezing, which sometimes doesn’t happen until near the end of April. 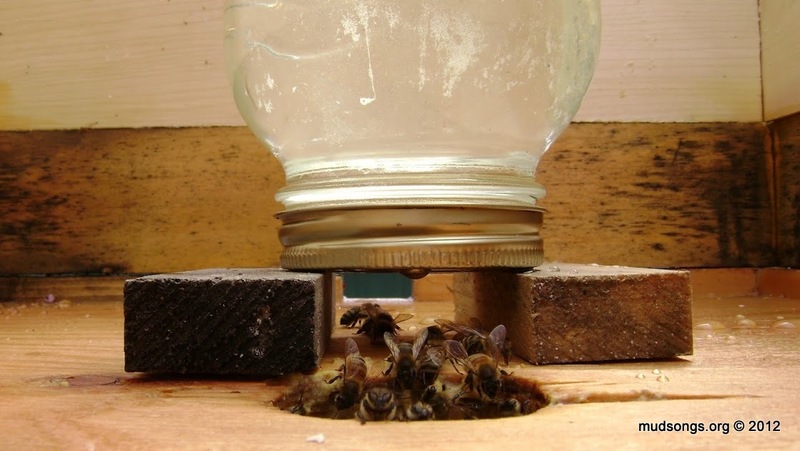 Tip #1-B: Place the jar between the inner cover hole and the top entrance (not between the hole and the back wall of the hive). 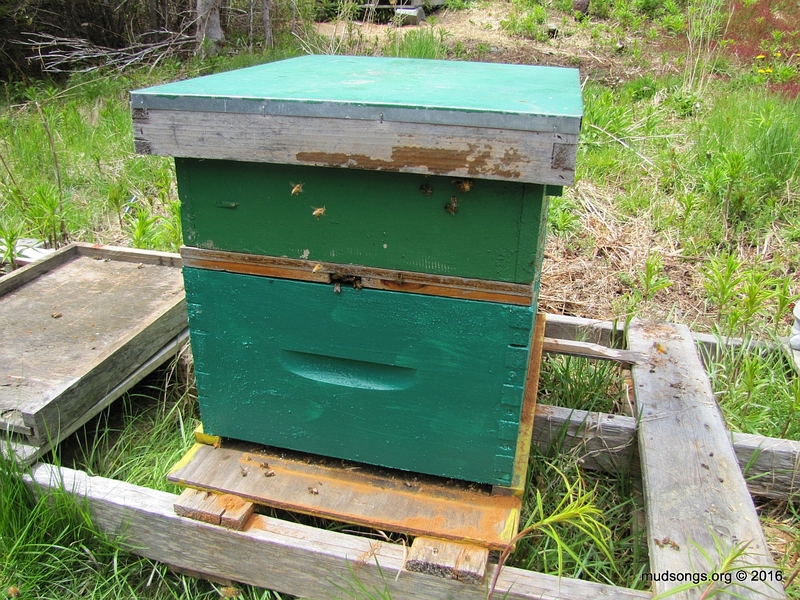 That way if the syrup does leak, provided the back of the hive is tilted up a bit like it should be, the syrup will drain out of the hive or at least to the front of it — and not down the inner cover hole and all over the bees. Tip #2: Rest the jar on two pieces of wood. When I first installed a jar feeder, I put it directly over the inner cover hole and blocked the hole. You don’t want to block the hole. 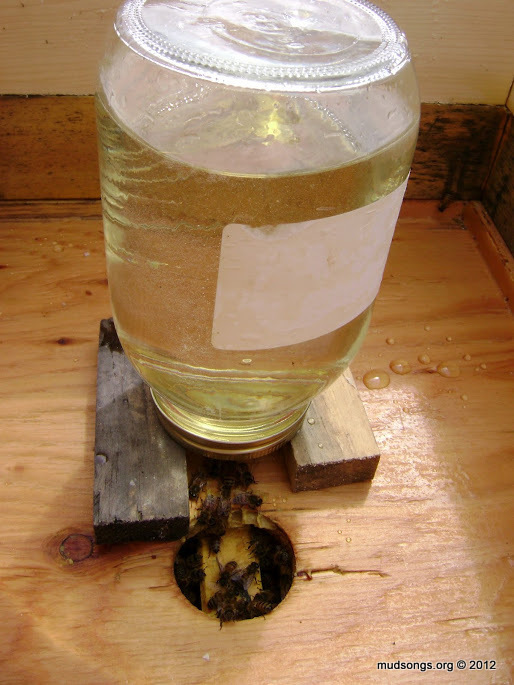 Here’s a photo of a jar feeder sitting on two pieces of scrap wood. You can even see the path from the top entrance in the background, to the jar feeder, to the inner cover hole (some call that a beeline). I probably shouldn’t even feed the bees now. I think they have plenty of honey, and if they eat their honey, it will free up space for the queen to lay more eggs. But until I can do a quick non-invasive inspection and I know for sure they have enough honey, I’ll play the paranoid card and feed them. P.S. : This is one way to install a jar feeder. If I find a better, safer way of doing it, I’ll update this post with that information. I’ve been known to be wrong on occasion. A rapid feeder that is placed over the inner cover hole.